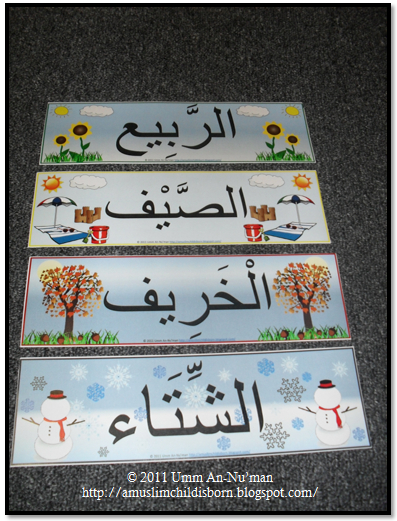 Back to School Preparations before Ramadan alhamdulillaah. 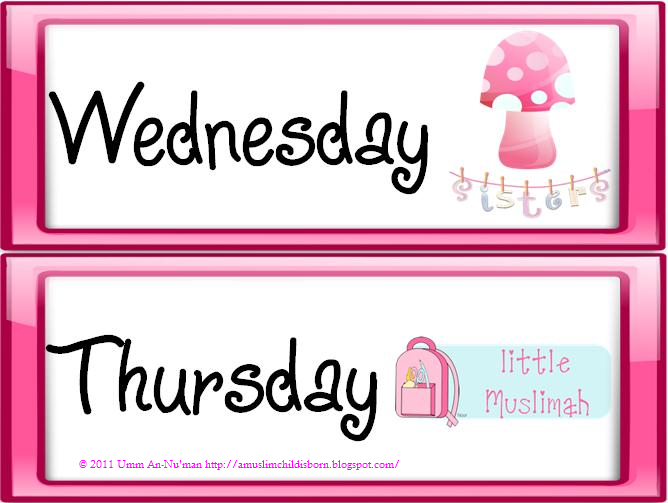 I even had the pleasure of making days of the week tags for sis Umm Suhailah! 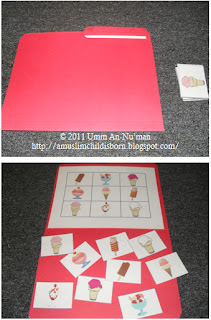 I saw these on a blog this weekend (in English) and thought this is a great way to teach/reinforce opposites! Jazakillaahu khayr! Lesson plans? Hmm...it depends on which grade I am teaching the next year. If I am teaching the same grade that I taught the previous year, I wait (procrastinate...*smile*) until around August. If not, I start around the end of July (sometimes...with no procrastination). A post about lesson plans? Good idea! I do not b/c well...I just did not think of it *smile*. Oh this is great! I love your blog so much I have your button on my blog. Great actvities for circle time mashaAllah. Ya akhawaat, I forgot about the questions about these files. Insha'Allaah, I will return to this this evening. Jazakillaahu khayr for your patience with me. Masha Allah. I love everything that you do! Wonderful ideas! 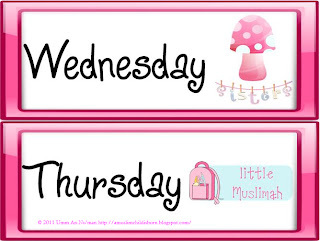 I wanted to ask you if you could make the days of the week in arabic Insha Allah. If you need to know the gender it is for my boys. Insha'Allaah, I will do my best but it may take a few weeks before I can post them. Do you want the same format/style? When I complete them insha'Allaah, I will add them to this post. Please check this post in about 1 week biithnillaah. JazakAllah for all that you. May Allah(SWT) reward you and your family. Jazakillaahu khayr sis Raisingsahabas. I must have forgotten to link to the book for what is the weather today. The link should be active in a few days insha'Allaah. Please check back then. Barak Allaahu feki. Salam mashaAllah your site has been very informative. May Allah continue to make it easy for to develop more activities and ideas for the school and home ameen. I think you are doing an amazing job. Asalamu Aleikum! I happened upon this site and hamdoulilleh that I did! Mashallah, you have wonderful ideas and it is really a labor of love that you put your creations out for others to be able to download and use, as well. 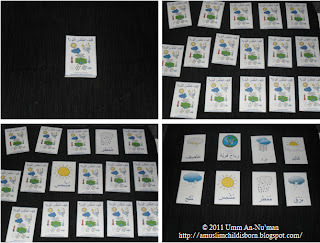 As a homeschooling ummi, I'm very pleased to have this site as a new resources for my little ones! Shukran jazilan! In an effort to reduce the amount of spam comments left on the blog, Anonymous posting has been disabled. Insha'Allaah, this will not be inconvenient to any of the readers. This blog was launched to please Allaah aza wa jal. 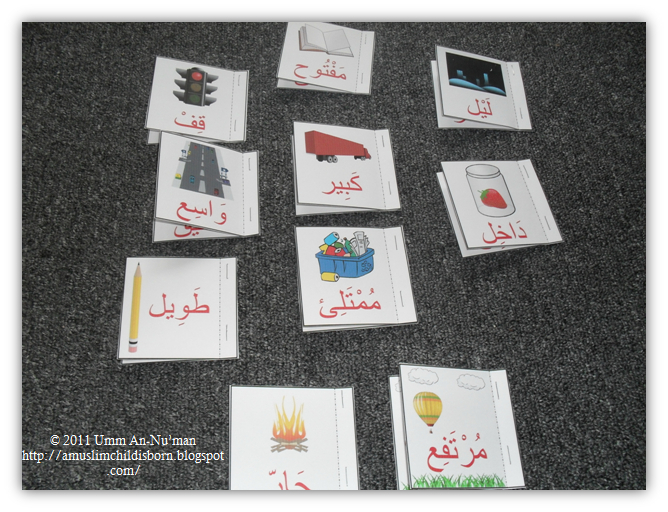 By raising our children correctly from the moment they are born, we hope to gain Allaah's pleasure in'shaa Allaah. To that end, resources and occasional articles that provide pathways to raising children who love Allaah and His Messenger (sallallaahu alayhi wa salam) will be posted here free as sadaqah jariyyah, in'shaa Allaah. We ask Allaah aza wa jal to accept this humble effort from us and place it on our scale of good deeds on Yaum-ul-Qiyama. Ameen. Please read this before downloading and/or using any material on A Muslim Child is Born. 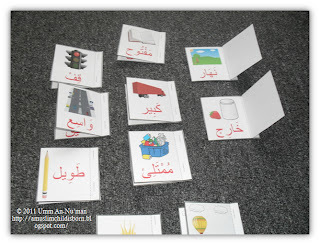 Ramadan Activity Book for Kids! Copyright © 2009-2018 Umm An-Nu'man/ AMCIB. Powered by Blogger. External websites or blogs found on A Muslim Child is Born do not necessarily reflect the views or opinions of the owner of this blog. Every effort is put forth to only recommend blogs or websites of those who adhere to the path of As-Salaf As-Salih and follow their way.